There's nothing like spectacular sight of these giants of the sea, as they emerge from the depths water of the ocean to take a big leap producing a big wave at the time of fall. From December to late March Puerto Vallarta and Banderas Bay becomes the temporary home of humpback whales, these majestic whales come each year to bread and their calves. Do not miss our tour, if you are lucky you will see the impressive skills from males to conquer females, with our hydrophone on board you can appreciate their beautiful songs live and admire the calves always attentive care of their mother . 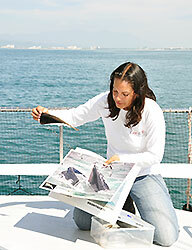 Our marine biologist on board will answer all your questions and talk about the marine life of the bay. Runs: Daily at 9:30 AM. Departs From: Marina Vallarta. Directions will be provided with your confirmation. Kids: All ages welcome. Kids prices apply to ages 6-11 years. Kids under 6 years old will pay 50 pesos in cash on the day of the trip. Our tours are open to everyone - no matter what country you're from, hotel guests, cruise ship passengers, residents, everyone! If you don't see whales, you can go again free of charge until you do get to see whales! OUR ADVICE: Don't forget your camera! This is a good tour for larger groups, or families with small kids. The small boat is faster and more exciting, but this boat is much more comfortable.